We provide simple ways for businesses to power their communications, applications, and authentications to reach people globally, boost innovation, and provide mobility. Use SMS, Mobile Chat, Voice and WhatsApp Business to communicate with customers in over 150 countries. Context is everything. With Number Information you can use the right channel at the right time. Harness the power of Multi-Factor Authentication to keep user information safe from fraud attempts. 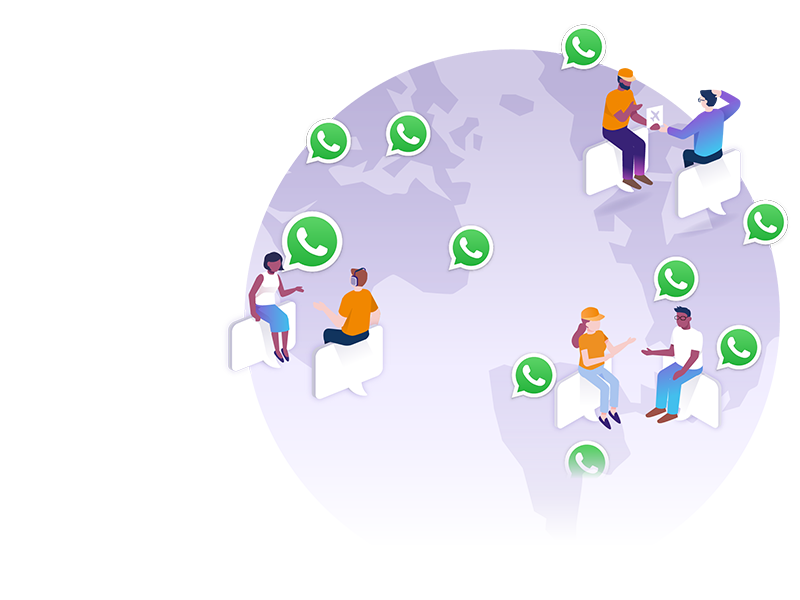 As an authorized WhatsApp Business solution provider, tyntec powers businesses to interact with their customers right on WhatsApp – all with the security and privacy that 1.5 billion WhatsApp users trust and rely on every day. Through tyntec’s Chat API, enterprises can send conversational notifications and support messages – and receive replies – without switching to a new software solution or UI. One access point for you to connect to 800+ operators across 150+ countries. As one of the three US inter-carrier vendors and a tier-one global A2P messaging provider, we’ve got you covered. Add our simple APIs into your business processes to start using communication features. Use what works best for you, APIs for machine interface or portals for human interface. We offer strict adherence to transparency. With our easy-to-navigate, real-time dashboards you'll gain visibility into our network performance — ensuring quality control. We value privacy and provide multiple secure transmission options (e.g., TLS, VPN). This ensures that data from our customers reaches our platform without being exposed. We undertake regular penetration tests (conducted by certified penetration testers) and automated vulnerability scans to proactively identify possible security flaws. To adhere to data privacy requirements, such as GDPR, we automatically delete all relevant files after 6 months and use encrypted partitions for data storage servers. No need to figure out how telephony works. Just add our simple APIs directly into your applications or business processes to start using our communication features. High volumes or wholesale conditions? Drop us a line for special conditions. We provide simple usage-based pricing and offer volume discounts. Discounts trigger as your usage grows, so you always get a fair price. The way businesses communicate with customers is changing. Businesses have more options. People have higher expectations. And mobile communication is at the heart of the change. Using telecoms can be hard. Not with us. Over the last 15 years, we've built an unmatched global network from the ground up and developed simple APIs to access the network. No matter what technology is chosen, we look after the complicated telecoms stuff, so you don’t have to.